Every child by nature is curious, imaginative, loves games and is full of energy or enthusiasm. And what is the nature of the text in the chapters he has to learn? Does it arouse his curiosity, channel his energy, fuel his imagination and does it make the learning process effortless as if playing a game? Visual thinking using Mind Maps is already being used by millions of students and teachers worldwide for a more engaging learning & teaching experience. A quick look at some of the opportunities where visual thinking techniques can be used to make the school journey of the child a bit more fun..
1) For Learning Chapters: A typical chapter from a middle school book runs between 5-12 pages. It can indeed otherwise be a little daunting or boring for the child to even see this long chapter. 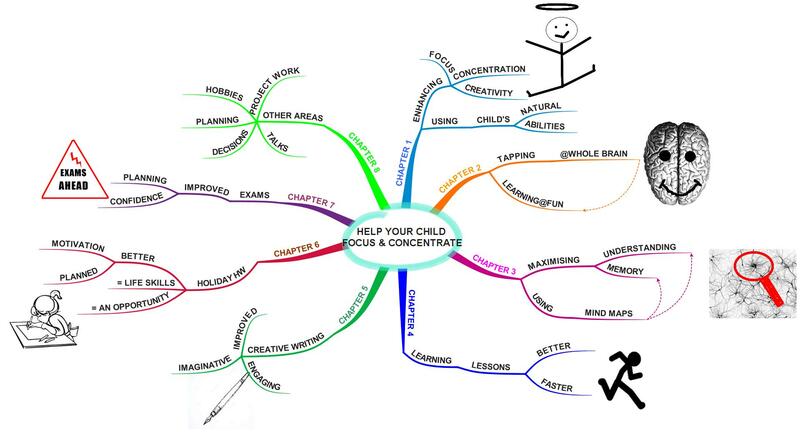 On the other hand if the child with the help of the parent can transform the chapter into a one page Mind Map it would become much easier for the child to, first, understand the chapter and, subsequently, to memorize it by the repeated quick browsing of the chapter’s Mind Map. 2) For Creative Writing: The basic ingredient for creative writing are your thoughts combined with a certain level of clarity to be able to capture them accurately on a piece of paper. But the challenge is, that the nature of our thoughts is radiant (moving in all directions from a centre) whereas the words that you put on a piece of paper are systematically arranged in a linear fashion. 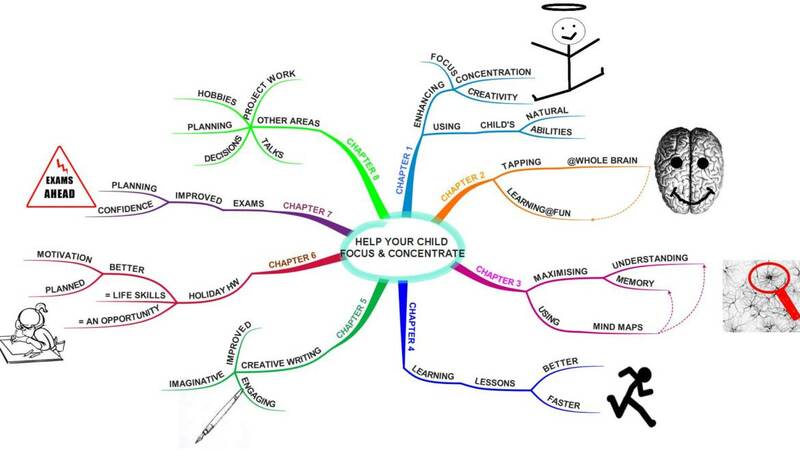 To fill this gap Visual thinking using Mind Maps is really helpful; which in a fun way allows the child to pen his thoughts in an unrestricted manner and afterwards stitching them nicely into an essay. 3) Managing Holiday Home Work Better: For the child who gets overwhelmed even with the daily home-work, it can indeed be daunting to face the “Holiday Home work”. It can potentially evoke feelings of anxiety, fear, boredom, etc. not only in the child but also in the parents! Again using a Mind Map to first to capture the complete Holiday home-work on a single sheet and then helping the child to use it as a progress tracking sheet keeps the child motivated, focused and gives him/her the confidence to complete the home-work in small bites every day..
4) Planning Better For Exams: The process is quite similar to managing the holiday home-work capturing the exam syllabus on a single page Mind Map; preferably using A3 and colors in the Mind Map. Again get the child to showcase his progress on it and do not forget to celebrate each time the child completes part of the syllabus of a subject. 5) For Project Work: Many projects that a child needs to complete, involve activities like researching for information, collecting pictures, making a collage etc. Researching for information can be a daunting task for a child. Using Mind Maps, however, it becomes easier to plan and break down the research into manageable tasks. 6) Hobby Classes: Kids also enjoy several hobbies be it sports or arts. Again, keep your eyes open for potential areas where visual thinking can be applied to enhance their learning further on the subject of their interest. 7) Planning for a school event can be fun and easy using a Mind Map. 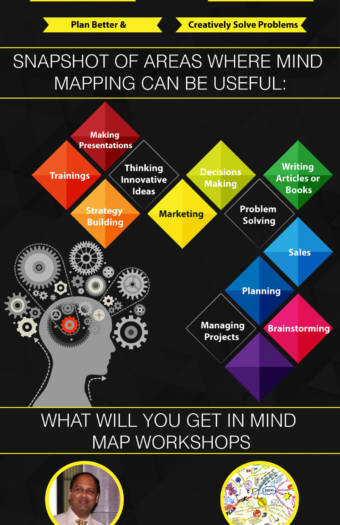 8) Decision Making: You can also introduce your child to the art of decision making using Mind Maps which helps the child look quickly and clearly at the various facets of a decisions. 9) Preparing for a school talk: Similar to the process of creative writing , visual thinking using Mind Maps can help a child confidently design & deliver a talk or presentation. There could be other parents in your network who could benefit from this hence please feel free to share forward. Thank you !